Is there a pattern to what I paint? Well, sorta, maybe. I have what is called in miniature gaming a “huge lead pile.” That means I’ve accumulated a large number of figures over the years that I just haven’t painted or gamed with. A shame, really. I should be forced to walk naked through the streets with a nun behind me ringing a bell and shouting “Shame!” But if you know any miniature gamer, then you know that she or he has a pile of figures gathering dust and mocking her about unfulfilled projects and unrealized dreams. I’m beginning to realize my mortality, so I’ve stopped watching television to a large extent and am using that time to paint and write. Plus, in a moment of madness, I set a goal to paint 520 figures this year. I know that is a lot of figures to paint, but it represents only the tip of the lead pile. 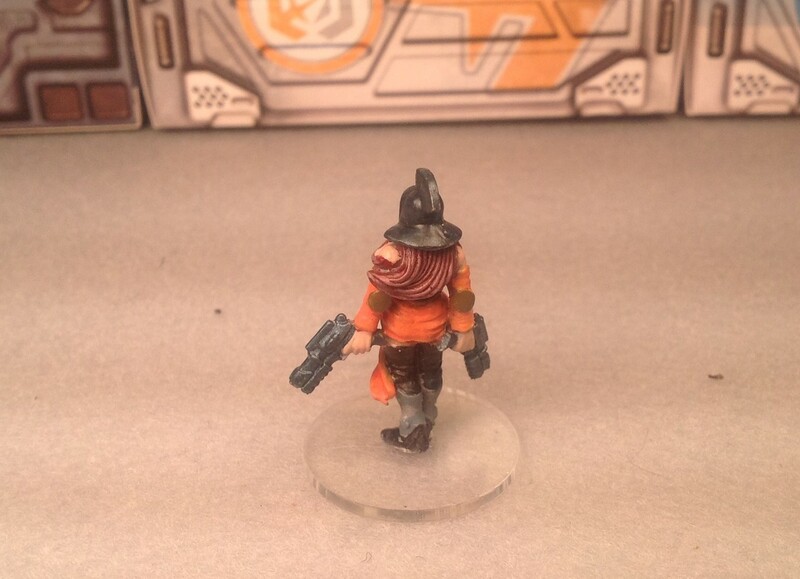 So enough babbling, let’s look at what got painted! In Cyberpunk fiction, the lone wolf has many names: street samurai, street operative, hired gun and solo. This figure is a female gladiatrix from Urban Mammoth. 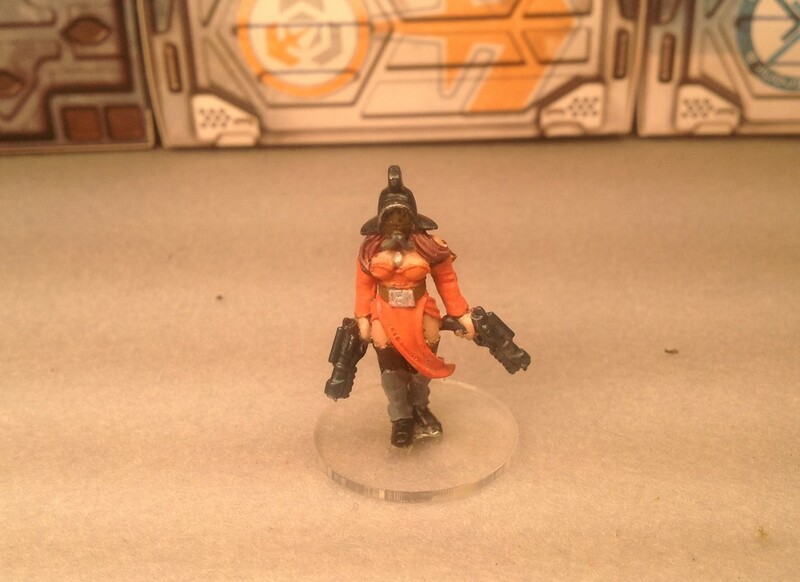 Whenever I paint a Science Fiction figure which will be mounted on a clear base, I use the opportunity to rebase other figures in my collection. 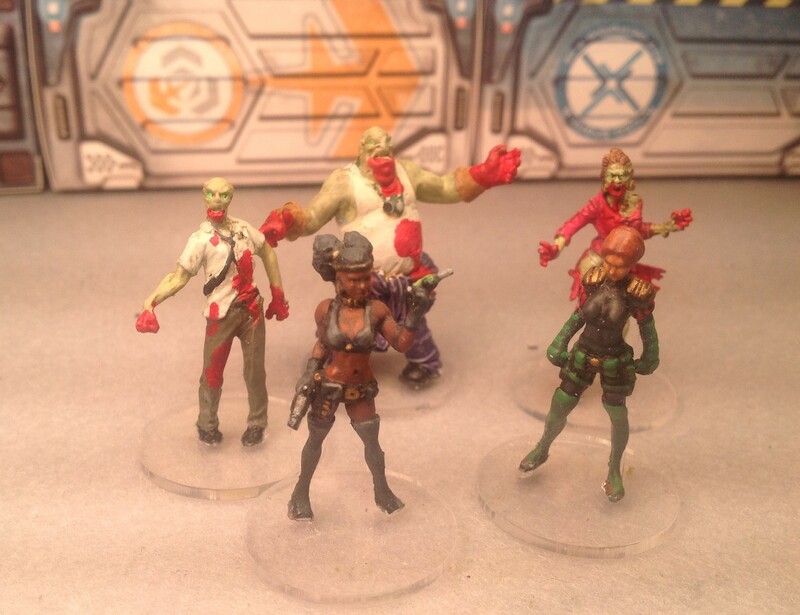 This time it is two pre-painted figures and three Zombiecide zombies. I have no idea who manufactured the two pre-painted figures. 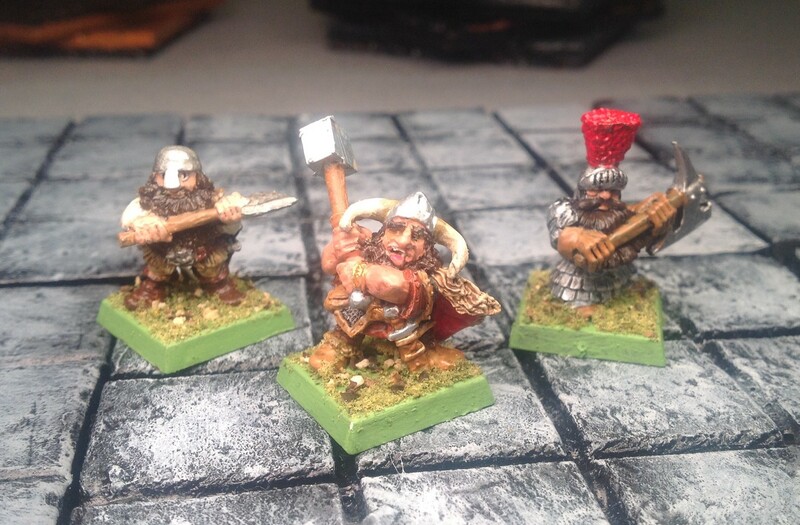 The zombies are from an ATZ Evolution game I ran last year where only a quarter of the figures were painted. It was a horrible month. I was trying to get ready for a convention and I broke a couple of teeth – ugh! the stress. I started gaming in the 1990s. My brothers were playing Warhammer and Warhammer 40K and had introduced my son to the hobby. 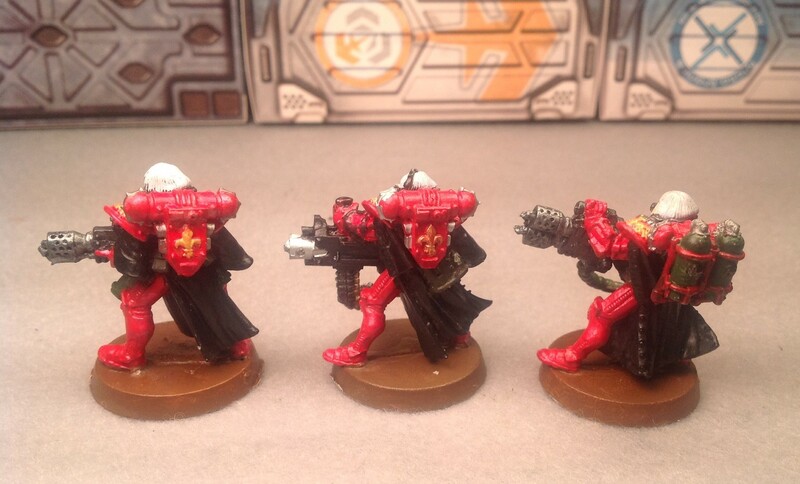 It began with my son asking me to help him paint Space Marines and escalated into a challenge to a game from my younger brother. 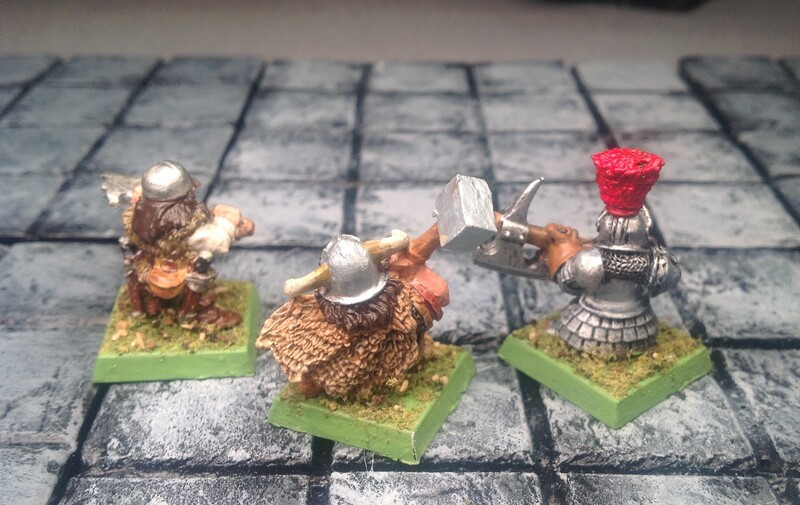 My first two armies were Squats and Dwarfs. 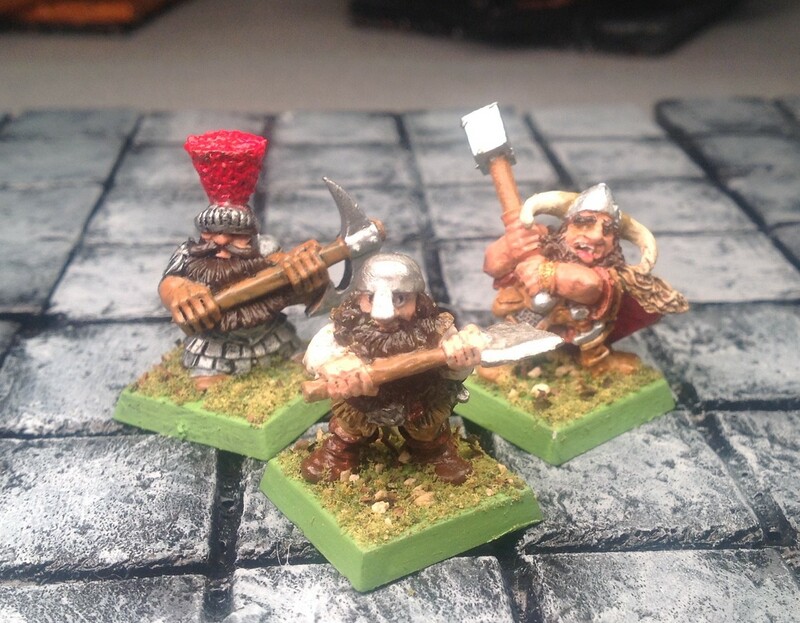 I sold the Squats long ago (sometimes I wish I still had them), but have hung on to the Dwarfs. 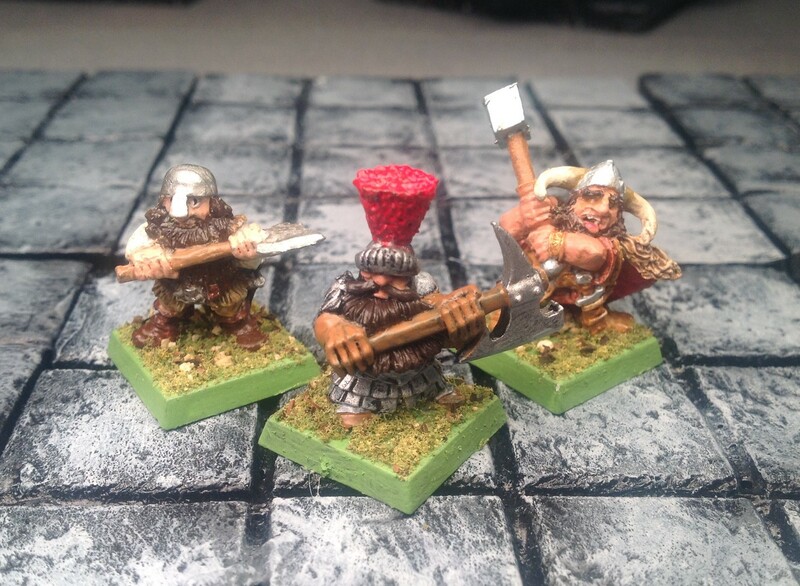 Games Workshop hasn’t sculpted decent Dwarfs in a very long time. They’re terrible. However, the old stuff, the sculpts from the 80s & 90s are wonderful – full of character. I finally decided on a color scheme for the heavy weapons used by my Sisters of Battle. 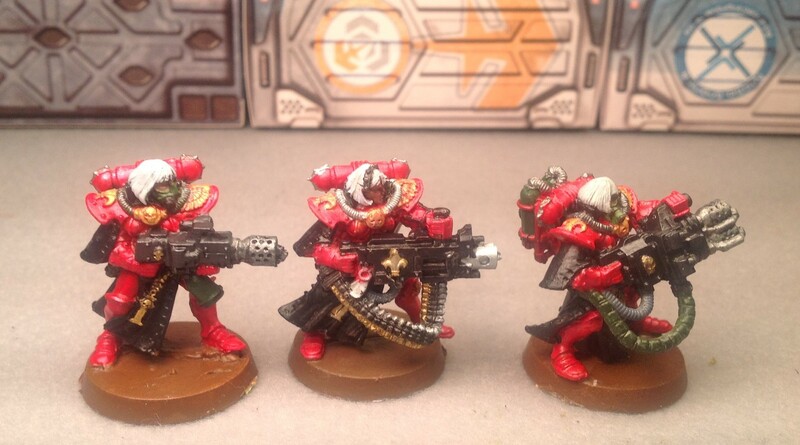 I’ve finished Sisters with a Flamer, Heavy Flamer and Heavy Bolter. Supposedly, GW is supposed to release plastic Sisters of Battle either this year or next year – a rumor we’ve heard for years. It may happen though, as I hear rumblings about unavailability of some of the figures. 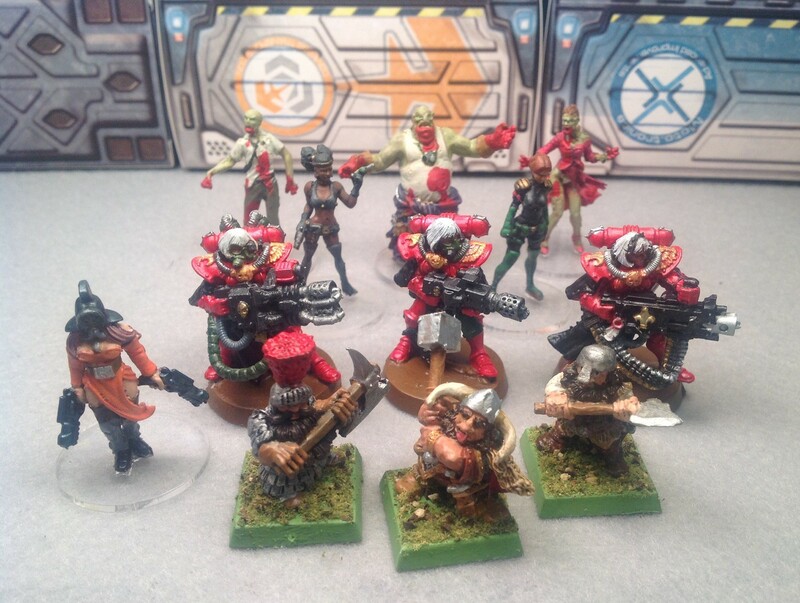 Not counting the terrain pieces or the rebased figures – the total of painted figures now stands at 61 figures for the year. Only 459 left to go! — I must be nuts. As usual, no floozies were harmed in the making of this post. Pictures were taken using my iPad (It’s getting to where I’m too lazy to pull out the camera and tripod). Please, please, feel free to comment. 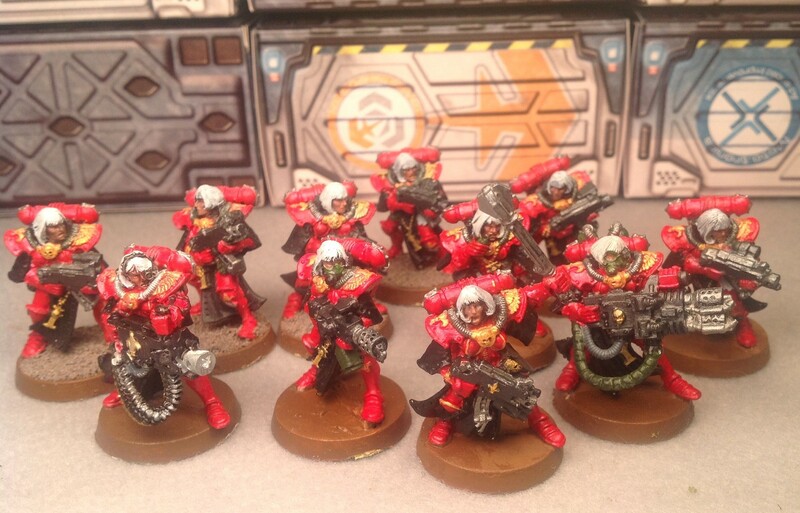 Sister Superior Caroline wants another crack at Gaea Prime’s heretical Marines! GO Get them HERETICAL GAEA PRIME MARINES And Hand them their Poop holes on a Wooden Tray?